This entry was posted in "Four legs good", Not a Review, Single Note Exploration and tagged Annick Menardo, Annie Buzantian, Christine Nagel, Demeter, DSH Perfumes, Jo Malone, lilac, Lilas Mauve, Opardu, Phaedon, Pierre Guillaume, Puredistance, Rue des Lilas, White Lilac & Rhubarb, Yves Rocher. Bookmark the permalink. I love the start of Opardu but it disappears so quickly on me, I’m pretty sure I’m anosmic to the main components of the base. Patou Vacation is not for me either. I can’t put my finger on exactly why it isn’t working, but most lilely I just don’t have the skin chemistry for it. Sad memories are usually much stronger than good ones, so I can see how many years later you canstill associate some scents with not the best time for you. Hopefully, it’s all far behind you and your newer fragrant memories are of a happier kind. Mysamples of Vacancies was probably too old because I couldn’t smell in there neithe lilac nor promised galbanum. I read many good things about it but probably itshould be considered as gone. What a delight to find your ‘lilac part 2’ today. I love lilac as well, but the soliflore lilacs are just not me, they seem a like unfinished perfumes at best, and fabric softener at worst. I think it’s partly due to the fact that lilac is not just a scent, it’s so many sentiments; nostalgia and hope and it spells spring! It can also smell so very different, that just the one aspect is not enough. I’ve been working on a similar post, and so far my favourites are: Vacances, which truly is amazing. Guerlinade, iPdF has a really meaty lilac called Lilla serenella (NOT serenella at all) which is far from the lilac any functional fragrance might use. A real Italian lilac. You can get LS with an Italian mule, but the two others are long gone of course. I like white lilac and rhubarb too (and was lucky to get a bottle) and lilac and heliotrope (Soivohle), and also really like Opardu, I think I would buy it in a flash had the price not been so extravagant. Asali, you’ve just created a fatty lemming! I’m so amazed by several perfumes from April Aromatics (thank you :) ) that now I’ll be waiting for her lilac. I’m really curious how it can be recreated with natural ingridients. I love lilacs and I do love the Ineke perfume but for the most part I also don’t want to wear it as a soliflore. I think that’s because I remember my mom, and now me, having a bunch of lilacs in the house every spring and the scent just filled the place up. I think I associate it more with a room scent than a perfume I would wear. Those anemic lilacs I manage to buy in California do not fill up anything: you can barely small them with your face buried in them. As for the lilac perfumes I had the similar reaction to Opardu, but the second wearing wasn’t really much better than the first one. I haven’t tried it sprayed, my sample is a dabber. Lucas, you should try Opardu again! After you hit the bottom of a disappointment the next time will be better! :) Probaby not enough to justify for you the price but you still might see it from the nice(r)side. Will do, I might transfer the juice from a glass vial into a plastic spray vials I have. Spraying might give it more potential. I have worn Pacifica’s French Lilac for a few year’s. I’ve also had Yves Rocher’s Pur Dersir de Lilas. I’m not a huge fan of soliflores, so I don’t tend to reach for them. I love Opardu, however. It is on my wishlist, but I do wish it lasted longer. After being inspired by this post yesterday morning, I picked a TON of lilacs. I posted a pic on Facebook Frag Friends, fyi. My whole house smells of them! I’ve been craving a lilac scent lately. I read both your posts and found them very helpful as I haven’t done any legwork yet. Fortunately/unfortunately for me, En Passant works on my skin and I do love it – though it disappeared rather quickly the last test I gave it. I’ll try some of the others in your posts. The two Asali mentioned in her comment sound interesting too! I will probably retry En Passant – just to see if anything has changed in these two years. Is Pacifica available where you live? Here you can buy it in Sephora or even some supermarkets (e.g.Whole Foods). If it is available start from it, preferrably in roll-on, start with it: nice and inexpensive. I picked it up today. I sprayed it on in the store and on the drive home my husband thought we had lilacs in the car. Heehee. Have you tried Miller Harris Coeur d’Eté? 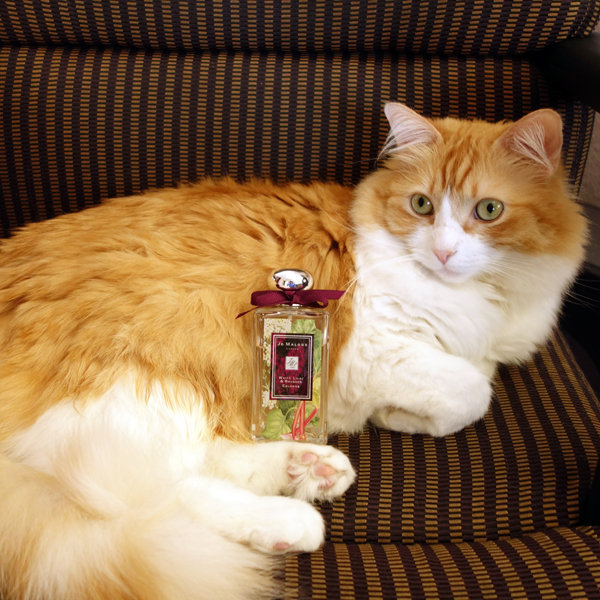 I find it to be an excellent lilac perfume. I also love Ineke’s After My Own Heart. I agree with you that the new Yves Rocher and the Demeter leave something to be desired, although the Demeter Naturals Lilac is better than the regular. I had almost no exposure to Miller Harris line but when I get a chance I’ll try Coeur d’Ete – thank you for the recommendation. So timely! I love vintage Le De in which I smell lilac (I think I reviewed it, too); but I have recently purchased After My Own Heart because I wanted a more modern lilac; it’s a bit smokier; and I am enjoying it very much. This spring I have been wearing a lot of Soivohle’s Lilas et Narcissus. I like it, my only complaint is that on the far drydown it’s a bit too sweet-vanilla for my tastes. I find it smells like Lilac mixed with spicy flowers. I can’t believe people are spending $300-500 on those Jo Malones! They were nice, indeed, but not worth that much IMO. It’s too bad about the Jo Malone limited editions really, because I usually can’t get it together quickly enough to make up my mind and buy them before they’re gone. Maybe I should just start buying them all and reselling for $500 on eBay! LOL! This year I did it! I bought Bitter Orange and Chocolate just to have it, it doesn’t work for me but I’ll see what to do with it in 6 months… But $500!!! People are crazy. I’ve never really sought out any lilac-centric perfumes – it’s one of the few florals I prefer to smell outdoors, in nature. And five years ago I worked in the office of a retirement community that had beautiful gardens – and one of the women I worked with insisted that our groundskeeper bring in bouquet after bouquet of lilacs when they were in bloom. She placed them everywhere, to the point that they were suffocating. People complained, but not too loudly, as she was bossy and the person in charge of paychecks and all other financial matters. If I were going to purchase a lilac scent, Opardu would be the one; that said, Opardu is not really me. Your photos of Rusty are always wonderful – this set in particular. Thank you, Suzanne! Rusty was a good sport (he was really interested to smell lilacs and with the bottle – I’m not surehe was totally awake ;) ). I think I’ll cease the active search but I’ll keep trying whatever comes my way. Undina, I used to wear the Yves Rocher a few years ago, but even if pretty, it seemed a bit coarse and unsophisticated, My current go-to lilac is Opardu, which was love at first sniff. I think that Yves Rocher works when your other perfumes are mostly mainstream ones. But when you move into more complex niche perfumes that “unsophisticated” characteristic becomes really noticeable. Dear Undina, I’ve said this before and I will say it again – Rusty is one gorgeous cat! As for lilac perfumes, I’ll stick to Puredistance Opardu…it is a beautiful fragrance and while it does not last very long, I would never layer or wear other body products for the purpose of extending its life. Yes, it is expensive, but I’M worth it :-). On a side note, what a difference between this and Bvlgari Black…I got my FB today! Rusty is very handsome. But he’s also an extremely well-natured cat – and we love him for that. Any perfume that costs more than $60-$70 is expensive just to have it. But when you love the perfume the price is secondary (provided you have disposable income). It’s better to pay a lot for one bottle of the perfume that you really enjoy than to get 3-4 “nice to have” bottles. I grew up with lilac growing in the garden, but rarely get to smell the real thing these days. I like After My Own Heart very much, second only to En passant, which remains my favorite. Some of the soliflors are too bright for me–like photorealist painting. En passant offers a true-to-nature lilac toned down by (and here I’m not sure) bread? rice?– something warm, almost neutral, and distinctly un-floral. In the end, for me at least, by imitating nature, but not perfectly, this blend conjures the full sensation of encountering lilac. In En Passant that bread (or whatever it is) note is what bothers me. But I might try it again and see if anything has changed since I tried it last. 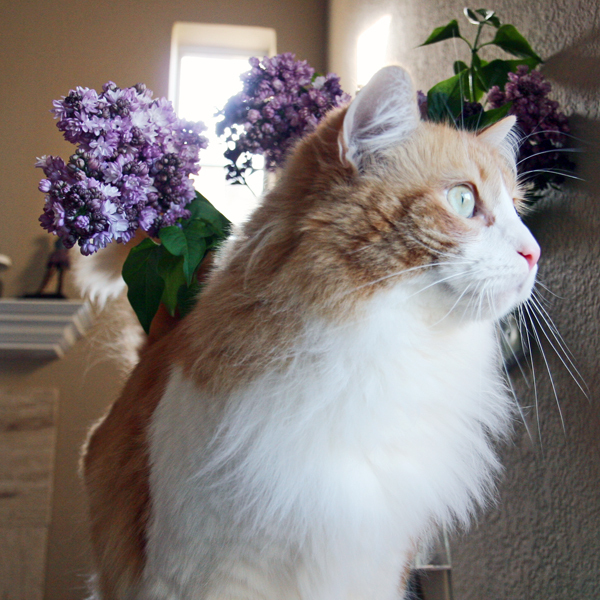 Oh, well, Rusty is like the Master of Lilac on the last picture! Handsome! I have some kind of fight with lilacs, too. So far the most natural I tried were White Lilalc and Rhubarb and En Passant, but I cannot wear them. It was also a spontaneous purchase last year when I caught a whiff of White Lilac and Rhubarb but something went wrong all the summer and in the autumn I swapped it. And I do not regret it since I got Balenciaga L’Essence. But still…lilacs are amazing in rich bouquet to me but I could not put up with their strange development on my skin – sour, sweaty or synthetic…I like Pur Desir de Lilas but it doesn’t last an hour on me! Guerlain’s Idylle Duet Jasmine-Lilas is a good take though not pure lilac. I love its retro touch with the subtle aldehydes. It’s interesting: in Idylle I smell either rose as a dominant note or lily-of-the-valley. I didn’t even realize there was lilac in there. Will try it again. 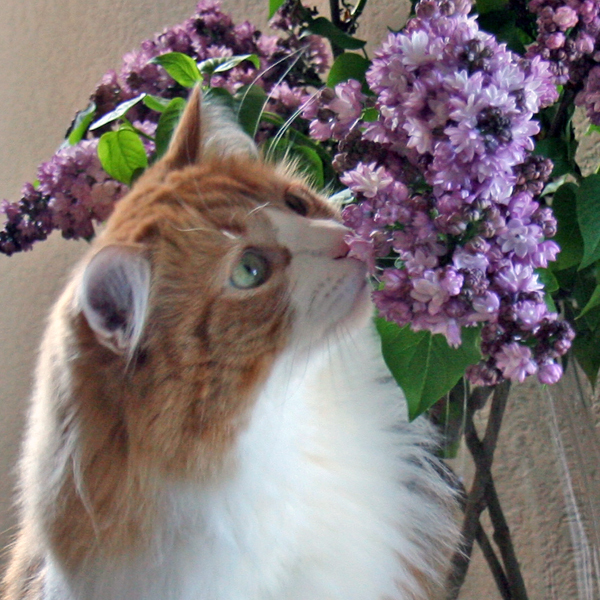 Mind you – the lilac note is in the Idylle’s flanker Jasmine – Lilas, not in the original. All other Idylles are rose variations to me, as well. As much as Rusty loves being patted and enjoys spending time onmy lap for some reason he doesn’t like when I try to hug him (or kiss). So I just rubbed his tummy and told himit was from you. Pacifica French lilac in the perfume concentrate (that would be the roll on versus the EDP parfum spray). Yes, you’ve mentioned it before. Maybe that’s why I had a different reaction to those two. An oldy but (periodically) goody is French Can Can from Caron. I say periodically because the Carons fluctuate and you just have to go to the boutiques and smell. Can Can is white flowers violets and lilacs over patchouli and is quite elegant, with a licorice thing going on in the background. Realize I’ll have to go try Opardu now. Somehow Carons almost completely went by me. I think I have a couple of samples that I have to test but in general I’m not familiar with the brand. Licorice is one of the notes I don’t like but I’ll test Can Can when I have a chance: I like the name. I’ve never really thought of finding a lilac scent until recently when I’ve come to miss the smell. When I was living at home, my mother had a large lilac bush that would flower and scent the yard and the house whenever we’d cut the flowers and bring them inside. I’ve been trying to find a fragrance that closely mimics the scent of those lilacs, and I might have to try some on your list :-). If you haven’t tried them yet, go for one of the most expensive (e.g. En Passante) and one of the cheapest (e.g. Passifica’s). If neither works for you as a perfume, get Demeter or Yves Rocher and use as a room spray. This is very timely. We aren’t getting as much lilac this spring, as we had a very wet and cold weather all the way up until very recently. But I did notice one or two in bloom in the neighborhood. I love the smell of lilacs, even though I don’t normally like them as a strong note in perfume. But En Passant is beautiful. I do agree with you about lilac being not so attractive as a soliflore – I also have this thing in the back of my mind about it being created wholly artificially. We don’t have the Pacifica line over here but it sounds like a must sniff for anyone wanting a realistic rendering of the note. Opardu was too laundry musky on me as you know, but I will see if I have a teeny drop left to stage a retrial as you recommend. Vacances, you say?.. ;) Interesting. As to the Pacifica’s perfumes – you should have commented just a couple of days earlier!